Hurricane Iniki was the third most damaging hurricane in U.S. history, and the most destructive to hit the Hawaiian Islands in this century. It was a small but intense hurricane which was classified as a minimal category Four on the Saffir-Simpson scale. Hurricane Iniki, just south of Kauai, developed winds estimated at 145 mph and gusts up to 175 mph. 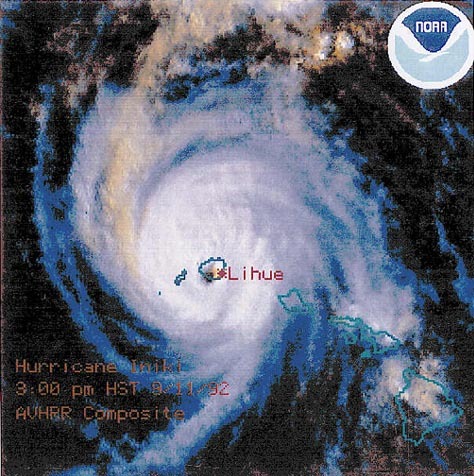 When Iniki moved over Kauai in the afternoon of September 11, 1992, wind speeds were estimated at 130 mph with gusts to 160 mph, and its central pressure was approximately 945 millibars. Iniki was accompanied by storm tides ranging from 4.5 to 6.3 feet above normal, with 20 to 35 foot storm waves. Heavy waves battered coastal areas of southern Kauai .The highest water levels and inundation of up to 22 feet above mean lower low water (MLLW) were reported by the Army Corps of Engineers near the Poipu area, just to the west of the Lawai Beach Resort. However, flooding of up to 27 feet above MLLW was reported by the Civil Defense, and University of Hawaii survey claims maximum inundation of 29 feet above MLLW. These values remain to be confirmed by more accurate surveys. The eye of the Iniki crossed the Kauai Coast just west of Port Allen near Kaumakani just before 4 PM Hawaiian Standard Time (HST). The most severe damage in Kauai occurred on the south, east and north of the island. At the Lawaii Beach Resort extensive wind damage begun as early as 1:15 to 1:30 in the early afternoon of September 11. It was around this time that extensive damage to the Beach house Restaurant occurred and part of its roof blew off. Maximum flooding begun around 3:30, as indicated by the Port Allen tide gauge, prior to the passage of the eye in the vicinity of the Port Allen area. At that time the astronomical tide was the highest and it was augmented by the reduction of the barometric pressure as the hurricane moved over the island. Superimposed on the higher elevation of the hurricane surge were the storm waves which intensified around that time as the winds were maximum and the landward component of wind friction reached its maximum value at the Lawaii Beach Resort around that time. Iniki was well tracked and average wind velocities and maximum winds were fairly well estimated during its development, or measured by aerial reconnaissance dropsondes during its fully developed phase on the 10th and 11th September 1992 (See the tracks, positions, and satellite thermal data in this report). Had this hurricane hit the island of Oahu, damage would have been much greater, and hundreds of deaths would have occurred. As the hurricane approached Kauai, its translational speed increased considerably to 30 mph making its passing quick but devastating. Had the translational speed been slower, the damage on Kauai would have been much worse. Iniki's path over Kauai is shown. Maximum winds were experienced near Poipu. There is a great deal of wind data that has been collected for historical hurricanes occurring in the Gulf and Florida Coasts. However not much wind data has been collected for hurricanes occurring in the vicinity of the Hawaiian Islands because there can only be a few recording stations on land. There are ocean buoys that can provide both wind and wave data, but only deep water buoy 51002, anchored some 280 miles south southeast of Honolulu, was close enough to record any data. Only wave data was collected by this buoy. On the island of Kauai, only WSO Lihue, the Navy station at Barking Sands, and stations at Makahuena, Princeville, Makaha Ridge, and Port Allen provided some wind data some of the time. There is not a great deal of wind data for the southern part of the island of Kauai. The only stations that reported briefly wind data were Port Allen and Makahuena (until it lost power). All available wind data is given in the data section of this report. Reported or Reconstructed Wind Chronology and Wind Directions of Iniki on September 11, 1992, at the Lawai Beach Resort, at Poipu Beach. All available wind data was collected for the islands of Kauai and Oahu (see tables). Data from Port Allen, Makahuena, and Lihue, were used in the assessment of wind speed and direction sequence at Lawai Beach Resort. A maximum of 227 MPH was reported from the Navy radar site at Makaha Ridge. This has been depicted as an anomaly due to improper instrument calibration; therefore unrealistic. I do not entirely agree with that. It may be possible to achieve such wind speeds from funneling (venturi) effects. The research by Dr. Fujita indicates that anomalous winds such as severe short lived downdrafts occur with some frequency. However, this may be an anomaly localized in a few areas. Before and after Iniki photos of beach in Kauai. No other such anomaly was reported elsewhere, and it certainly would not require winds of such strength to do the damage. Winds of much lower speed were responsible for most of the damage. Based on the scant data that was available and from other data of better documented historical hurricanes, a brief qualitative chronological sequence of winds at the Lawai Beach Resort can be reasonably deduced. A more quantitative determination of wind velocities and directions can be calculated using numerical modelling techniques ( see Appendix, which is a partial report entitled " Verification Study of a Bathystrophic Storm Model" by George Pararas-Carayannis). This report explains the technique for developing the wind field for historical and design hurricanes and for calculating the extent of hurricane flooding. Such numerical modelling can be used to develop a complete wind field for any location based on a few measurements of actual wind speeds and atmospheric pressure distributions. This was not done for the present study as it is very time consuming. However, the available wind information on hurricane Iniki from Lihue, Makahuena, and elsewhere, was extrapolated to the Lawai Beach Resort. Patterns of historical hurricanes were examined and available satellite photos were analyzed, the time history of wind velocities and directions for only one point (Beach House Restaurant) were determined using the technique outlined in the Appendix (pages 70, 71, 72). Using such data and methods the chronology of wind speeds and directions which affected the Beach House Restaurant on September 11, 1992, was deduced (See diagram showing the Lawaii Beach Resort restaurant, and wind speeds and directions). Note that the destructive winds that caused most of the damage at the restaurant , and other buildings occurred between 1:00 PM and 2:00 PM and were primarily from an eastern direction. The Wind sequence and chronology at Poipu Beach were estimated by the author based on application of a mathematical model ("Verification Study of a Bathystrophic Strom Surge Model" by George Pararas-Carayannis, Technical Memorandum No. 50, U.S. Army, Corps of Emgineers, Coastal Engineering Research Center, May 1975, a study supported by the U.S. Atomic Energy Commission (AEC)(now, U.S. Nuclear Regulatory Commission). 1. 8 AM, HST: The storm center was about 180 miles south of Kauai. The intensity of the winds had reached a peak of 145 mph with gusts as high as 175 mph. Winds at the Lawaii Beach Resort were somewhat strong but not unusual. Perhaps gusts of up to 35-40 mph were experienced. 2. 11 AM, HST: The center of Iniki was near 20 N and 160 W, about 130 miles south southwest of Lihue, moving northward at 17 mph. Maximum winds remained at 145 mph with gusts to 175 mph. Gusts at the Lawaii Beach Resort were gusting up to 55 mph. 3. 12 Noon: Winds at Makahuena were from the east -northeast (appr. 060) with sustained speeds of 55 mph with gusts of 62 mph. The Lawaii Beach Resort area was getting hit with similar winds from the same direction. Some wind damage had begun already in the area. Roofs of well constructed buildings were still intact. 4. 1 PM, HST: The center of Iniki was at 21.1 N and approximately 160 W, with winds remaining in the maimum range of 145 mph with gusts to 175 mph. The hurricane translational speed was averaging 27 mph. At the Lawai Beach Resort winds were averaging 65 miles per hour with gusts reaching 90 miles per hour. At this time the roof of the Beach House restaurant began to lift and vibrate. Evidence of gradual directional uplift can be seen in the photographs. 5. Sometime between 1 PM and 2 PM, and most probably around 1:15 to 1:30, wind strength at the Lawai Beach Resort ecxeeded the wind design threshold of 80 to 100 mph of most buildings constructed in the area. The following is the most probable sequence of events: The winds were blowing from an eastern direction which accounts also for the damage to that section of the Beach House restaurant roof. Destruction begun gradually. First, one or two of the glass windows(doors) in the eastern part of the restaurant blew in. Subsequently glass walls and sliding glass doors on the makai side of the restaurant blew out (Evidence of this was found on the beach in front of the restuarant. Large pieces of glass and of the window frame were collected there). Wind funneled through the restaurant causing extensive damage. The roof at the eastern part of the restaurant begun to vibrate and lift. The lifting intensified until finally the roof acted as a sail catching the wind, and blew off. The roof failure begun near the Kitchen area (see photographs). The wind was forced in the attic space between the roof and the plasterboard ceiling. The high pressure caused by the wind, found a point of least resistance at the northwest side of the building and blew the plasterboard ceiling downward. Most of the roofs of the Alii Building were also blown off around that time. Evidence of this sequence of events was discovered. A detailled inspection was made on the roof of the Beach House Restaurant. A large section of the wind- removed roof still lies undisturbed on the flat section of the roof above the kitchen where it was deposited by the winds on September 11th. The location of this piece of roof proves unquestionably that the winds that resulted in the failure were from an eastern direction and were funnelled between the two buildings to the east of the restaurant which may have amplified the effects.The time of such wind occurrence was between 1:00 and 2:00 P.M. and most likely around 1:30 P.M.
6. 2:30 PM, HST: , as Iniki approached closer, winds at Makahuena were from the east (090) with average speeds of 80.6 mph and gusts ranging from 115.5 mph to 143 mph. Winds at the Lawai Beach Resort were similar in direction and speed. Destruction from the wind was already complete at the Beach House Restaurant. The roof of the Beach House Restaurant had already been blown off. All lighter furnishings had blown away. 7. 3 PM, HST: The center of Iniki was very near the southern coast of Kauai at 21.6 N and 159.7 W, about 37 miles soutwest of Lihue. Forward translational speed had accelerated to 30 mph. As a rule, winds are strongest when the flow is downslope. Therefore, the strongest winds to hit the southern coast of the island occured before the passage of the hurricane eye sometime between 3:15 and 3:30 PM.It is estimated that the winds by 3:00 p.m. had shifted and were coming from a souteast direction at speeds averaging 100 miles per hour with gusts up to 130 mph. It is believed that Poipu and the Lawai Beach Resort were some of the hardest hit areas by wind around that time. Maximum winds hit the Beach House Restaurant around that time, but destruction was already complete. Winds of lesser strength had already blown the roof of the restaurant. 8. 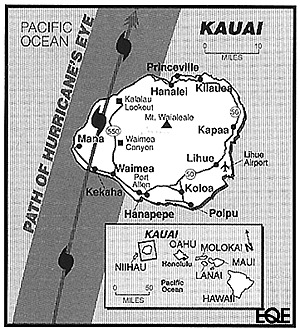 Between 3:30 and 4:00 PM, HST, the eye of Iniki was approaching the southern part of the island. At 3:52 PM Lihue Airport reported a sustained wind of 97 mph from a southeast direction with peak gusts estimated at 129 mph. Highest wind gusts at near Poipu were from a south southeast direction at speeds estimated to range between 100 to 140 miles per hour. 9. At just before 4 PM, HST, Iniki crossed the Kauai coast just west of Port Allen. There is no recorded wind direction data for the Poipu area during the critical time between 3:30 and 4:00 prior to the hurricane crossing the south coast of Kauai. However, based upon past behavior of historical hurricanes elsewhere, the wind direction must have changed considerably and must have been from a southern direction during that time.The Poipu area and Makahuena were approximately 10 miles from the hurricane landfall point which was just west of Port Allen. In all probability, the Makahuena area and Poipu were in the region of maximum winds, which was also the area of maximum flooding during that time period. In the short period between 3:20 to 4:00 p.m., prior to hurricane landfall, and because of Iniki's fast forward translational velocity and ellipsoid shape, the wind direction changed rapidly from the eastern direction to a direction from the south south-east and then to south.. It must have been during that particular period of time that the frictional effects of the wind were in a landward direction, and coupled with the astronomical tide (which was maximum at that time), and the rise in sea level due to the reduction of atmospheric pressure (as the hurricane center was approaching), resulted in maximum flooding. The peak gust at Makahuena Point was reported at 143 mph (extracted from data recorder), however the direction has not been documented, but it is believed to be from the south southeast..
10. 5 PM, HST, the center of Iniki was at 23 N and 159 W, or approximately 50 miles north of Kauai. The hurricane was moving fast away from Kauai. Its translational speed was 30mph. At 5:10 PM the sustained wind reported at Lihue Airport was from the soutwest at 90 mph, with a peak gusts of 122 mph. The Poipu Beach area was probably receiving winds of lesser strength than Lihue (probably up to 90 miles per hour) by that time from a west southwest direction. After 6:00 P. M. winds subsided quickly as the hurricane moved fast away from the island. Flooding: Tides ranging from 4.5 to 6.3 feet above normal resulted from hurricane Iniki with highest values occurring at Port Allen and Poipu.Waves generated by Iniki reached 20 to 35 feet. Deep water buoy 51002, anchored some 280 miles south southeast of Honolulu recorded significant wave heights of about 20 feet, which would indicate a most probable wave height of about 36 feet. These would be consistent with the surf damage on the south coast of Kauai where waves ranging from 20 to 30 feet must have occurred. 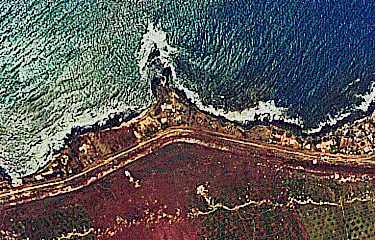 Extensive inundation of the Poipu area is supported by debris lines ( from aerial photographs as shown). Inundation ranged from 17 to 22 feet above MLLW, although higher maximum values were reported recently by the Civil Defense (27 feet above MLLW), and the University of Hawaii (29 feet above MLLW). These values remain to be confirmed by more accurate surveys. High water mark elevations were at approximately 18 feet above MLLW at the Lawai Beach Resort. In the garage of the Poipu Beach Resort, landward from the Beachouse restaurant, maximum water runup was approximately 17 to 18 feet above MLLW. Within the restaurant high water marks were observed on the walls at elevations ranging from 16 to 17.5 feet above MLLW. Maximum water levels along a coast due to a hurricane do not always occur at the same time. The time of the maximum surge at one location, may differ significantly from the time of flooding at another location. The location of the maximum surge relative to the location of the hurricane landfall will depend on the offshore bathymetry, the windfield, the configuration of the coastline and the topography, and the actual path the hurricane takes over the shelf. For a hurricane such as Iniki, which was moving more or less perpendicularly to the southern coast of Kauai, the peak surge occured close to a site on the southern shore where the region of maximum winds interesects the shoreline, at a radius R, to the right of the storm center.This would have occurred close to the Makahuena area and even east of Poipu. Because of the limited availability of observed hurricane surge data for Iniki, the exact chronology of storm wave flooding is somewhat difficult to reconstruct. One has to rely on whatever little quantitative wind and water level data may be available. However based on other hurricane data, and well established statistical and empirically -derived computations, the hurricane flooding history can be estimated for a given point for each time increment of the advancing hurricane. Peak surges and times can be calculated based on certain empirically-derived assumptions of wind and sea bottom friction coefficients. A study of the local wind fields and calculation of the wind onshore components, and set-ups, can be made. In the instant case , these estimates were made for one point only (Lawai Beach Resort, and specifically the restaurant) and for every three-hour time interval of September 11, 1992. The water level changes and flooding chronology at the Bech House restaurant was reconstructed from all available data on water levels and deduced wind speeds and directions. Using such data and by calculating the set up components of wind and wave action and the astronomical tide component, a flooding hydrograph for the Lawaii Beach Resort was reconstructed (See diagram). Note that maximum flooding at the site occurred at 3:30 P.M. The following is a descriptive analysis of the flooding effects. Flooding Effects: As the Port Allen tide gauge record shows, the water level was fairly normal until approximately 11:00 A.M. in the morning of September 11th. The water level begun to rise gradually. 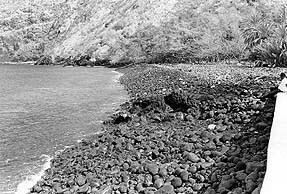 By 2:00 P.M on September 11, 1992, the water level was much higher and superimposed on this new water level were the wind waves generated by Iniki that were crushing on the southern shores of Kauai. 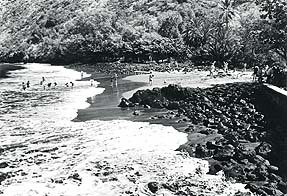 However, at Poipu at that time, the wind directions were from the east northeast and had an offshore frictional component which flattened the height of the waves at Poipu and at the Lawaii Beach Resort, and decreased the potential of more extensive flooding.Some flooding was occurring, but the Beach House Restaurant at its 12.6 lower level elevation, was not affected. This may not have been the case at Lihue at that particular time. On the eastern shore of the island the waves must have been creating havoc because of the onshore frictional effects of the winds blowing from the east -northeast direction. The Port Allen tide gauge record shows a rapid rise in water level between 2:00 and 3:30 P.M., followed by a rapid drop in sea level a little after 3:30 P.M. However, the significance of the tide gauge record must be explained. The record shows only the water level changes due to the astronomical tide and to the atmospheric pressure fluctuation. Furthermore the gauge filters out short period storm waves and other short period oscillations of sea level. Finally, since tide gauges are designed to monitor long period oscillations of sea level rather than storm waves on an open coast, they are usually located in protected areas of a harbor and thus do not measure open coast waves or wave runup. The actual crossing of the hurricane occurred at the southern coast of the island at 3:58 PM. That resulted in the maximum astronomical tide as shown by the Port Allen tide gauge record. The Honolulu tide gauge record shows the high water mark occurring approximately half an hour earlier. This is consistent with the hurricane's path and high speed of translation. As shown by the records, the water fluctuation is inversely proportional to the barometric pressure. Thus, when the hurricane eye passes close to the tide gauge station, the water level change recorded by the tide gauge is the highest, as the level of the sea responds to the reduction of the barometric pressure. However, the tide gauge does not record the highest elevation that storm waves reach, because it filters the shorter periods of these strorm waves. Thus the tide gauge record only gives the highest astronomical tide and the time of its occurrence, but does not provide the time of the highest inundation. The highest inundation occurs prior to the hurricane eye crossing of the coast, when winds are the strongest and have their major frictional component in a landward direction. The maximum waves that struck the vicinity of Beach House Restaurant building at the Lawaii resort came from a southern direction ( approximately from 170 to 180 degrees).The offshore topography and wave refraction dictates the wave direction regardless of the wind direction. This is consistent with the observations of damage effects on the restaurant and the failure of the walkway along the waterfront (see photographs). The waves cannot take a different path. The direction of accumulation of coral gravel and its gradation, in front of the restaurant, indicate also that the maximum waves came from that direction. The strength of the wave action must have been awsome. A large angular boulder weighing several hundreds pounds was found in the middle of the kitchen of the Beach House Restaurant. This rock was carried by wave action a little after 3:30 PM through the opening where the glass wall existed ( blown by the wind). The rock (see photographs) bounced off the wall of a utility room in the kitchen area (no longer there). The rock's path was determined by matching pieces of paint enbedded in the rocks as it bounced off the wall of the small utility room. The wall of this utility room was destroyed by wave action subsequently to the deposition of the rock in the kitchen.